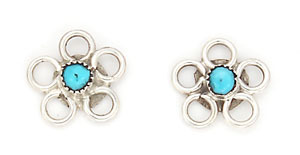 These sterling silver open flower earrings have a small handcut turquoise stone in the center. They measure approximately 7/16" in diameter and are made by Zuni artisan Stephen and or Alina Bowannie. Size and shape of stone may vary. ***Only available in white synthetic opal . *** None available in turquoise like pictured.